Florida Trail, St Marks East | Apalachee Bay | Florida Hikes! 14.3 miles. 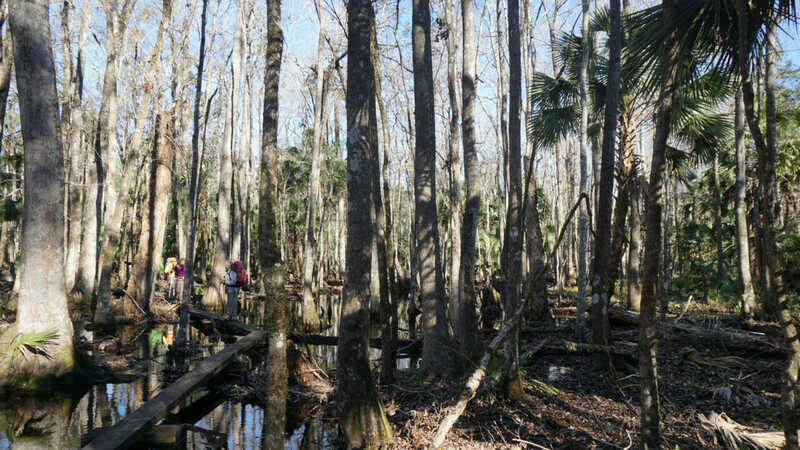 Slipping out of the jungle-like floodplain forest thats surround the tributaries of the Aucilla River into the coastal salt marshes along Apalachee Bay, this hike offers some of the most breathtaking panoramas you’ll find along the Florida Trail. 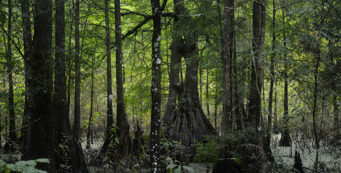 Along this very unique section of the Florida Trail, the breathtaking sweep of Florida’s Big Bend provides a framework around a hike through both natural and man-made habitats that edge Apalachee Bay, the coastal shallows of the Gulf of Mexico. Using a historic railroad grade to cross extensive coastal swamps, it links the Aucilla River floodplain with the extensive levee and road system along impoundments built between the Pinhook River and Lighthouse Road in St. Marks National Wildlife Refuge. Hunting is permitted in St. Marks NWR at certain times of year, so be sure to check hunt dates before hiking here, and wear bright orange clothes during hunting season. Bicycles are allowed on the levee road sections of this trail within St. Marks NWR, but they are forbidden to enter the wilderness area to the east of Aucilla Tram Road and the wilderness swamp hammock near Deep Creek. Planning to backpack? 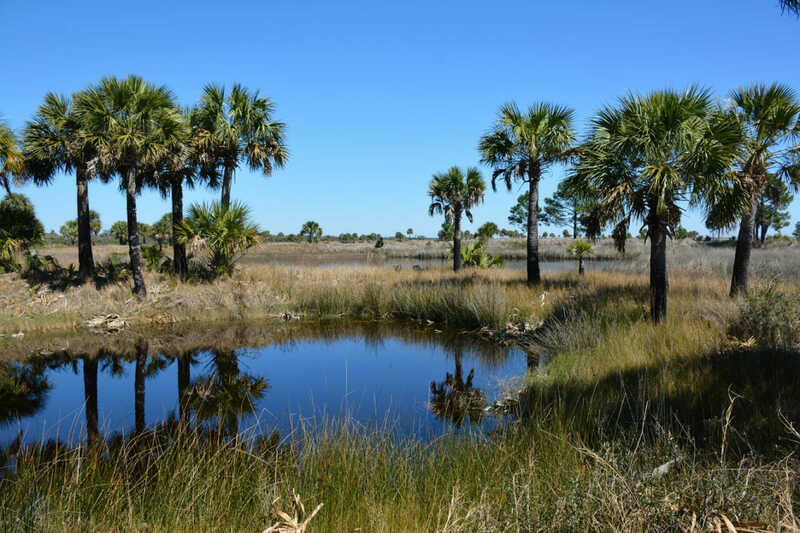 There are two designated campsites along this section, the Pinhook Campsite, adjoining the Pinhook River, and the Ring Dike Campsite, which has the most outstanding views of any campsite along the Florida Trail, but no fresh water. 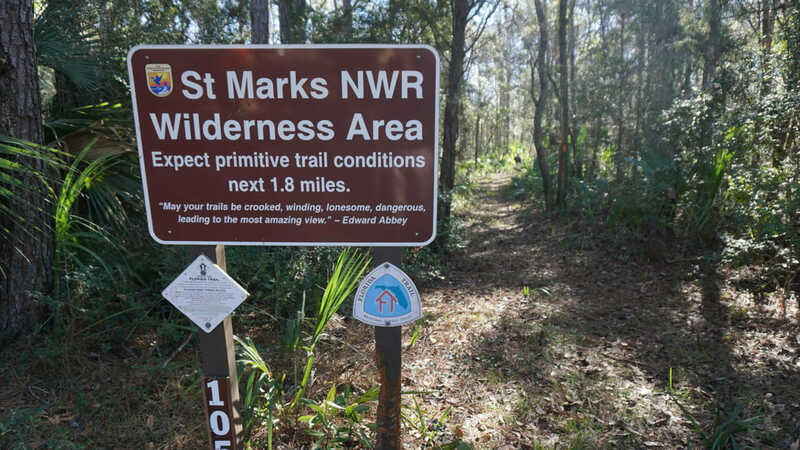 As St. Marks NWR is the only National Wildlife Refuge that permits backcountry camping, there are rules to follow. First and foremost: get a permit and pay your camping fees in advance. Camping is only allowed in designated campsites. You may only camp if you are backpacking across the entire refuge, a 47.4 mile traverse that includes a river crossing. See permit details. Call the refuge at 850-925-6121 if you have any questions about the process. 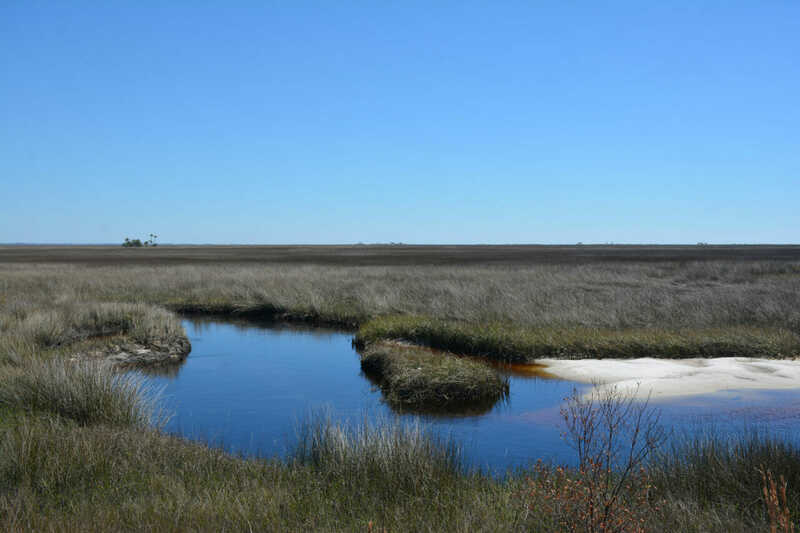 Backpackers: fresh water sources are limited throughout St. Marks NWR because it is along the coast. Tides affect water sources, as does a growing issue with saltwater intrusion, particularly in this area. The Pinhook River used to be a trustworthy water source, but no longer. Tidal saltwater intrusion now affects it. Assume that it is a freshwater source only at low tide, and filter and taste a little before filtering a lot. There are only two access points by car to this section of the Florida Trail, and both are off US 98. For the starting point at Aucilla WMA, drive east on US 98 for 12.3 miles, passing Lighthouse Road, Flint Rock WMA, SR 59, and signs for Aucilla WMA en route. The turn onto Small Game Road in Aucilla WMA can be easy to miss. Watch for the large FNST sign. If you end up at the Aucilla River bridge, you’ve missed it. Turn around at JR’s Aucilla River Store and come back towards it. Turning south onto Small Game Road – a narrow one lane road – drive with care through the swamp forest and beneath the power lines – where the sand can be muddy or soft, use caution – to find the pulloffs on more solid ground up at the next FNST sign. Do not block the road. For the St. Marks NWR ending point on Lighthouse Road, turn off US 98 east onto Lighthouse Road right across from Newport Park immediately after you cross the St. Marks River on the highway bridge. Continue down Lighthouse Road into the refuge, stopping to pay your day use fee ($5 per vehicle) at the tollbooth (on weekends) or iron ranger. Continue past the Visitor Center for another 1.8 miles to the pulloff where the views open up along the East River Pool and Stoney Bayou Pool. There is a small amount of parking next to the gate. 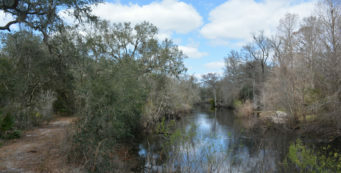 As you leave the small parking area within Aucilla WMA, the hike begins with a sometimes-difficult traverse (depending on water levels and blazing) into a floodplain forest in a federally designated wilderness area inside St. Marks National Wildlife Refuge. Boardwalks bridge some, but not all, of the swamps. Once you’re a couple miles in, following the trail becomes easier as it joins the abandoned railroad bed of the Live Oak, Perry & Gulf Railroad. Established for logging the cypress and pine out of this region, the railroad was at its peak of service in the 1920s, when it provided transportation for the logging community of Flintrock, its western terminus being several miles west of here. Trains would haul felled timber back to Perry for processing in the sawmills. 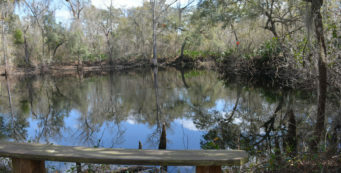 As it exits the wilderness area at the Aucilla Tram Road, the trail follows roads and levees for the remainder of the hike. 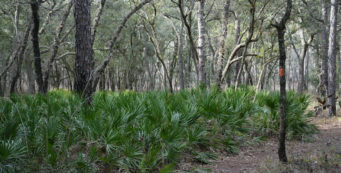 This makes it a good destination for a group hike, but also means limited shade, except where the trail plunges into the coastal swamp hammock – a dense, often soggy forest of cabbage palms – near Deep Creek. 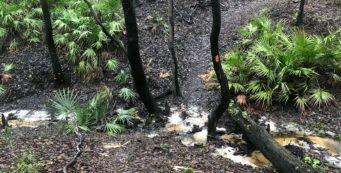 If that portion of the trail is too messy for your taste, use the levee roads as a bypass, turning left at the junction with the Deep Creek Trail to reunite with the orange blazes near a bench. The Deep Creek Trail provides loop access from Lighthouse Road to this next spectacular segment of the trail, where the levee guides you out into the wide open spaces of the Big Bend. It’s here that you can stand in one spot and actually see the curvature of where the Panhandle and Peninsula meet. Keep alert for signage and blazing where levees meet. Broad open marshes stretch off in all directions, but you keep your feet dry while hiking on the levee. Views are spectacular along the trail between the Ring Levee Campsite – a must-stop for the views from the bench – and the end of this section at Lighthouse Road. 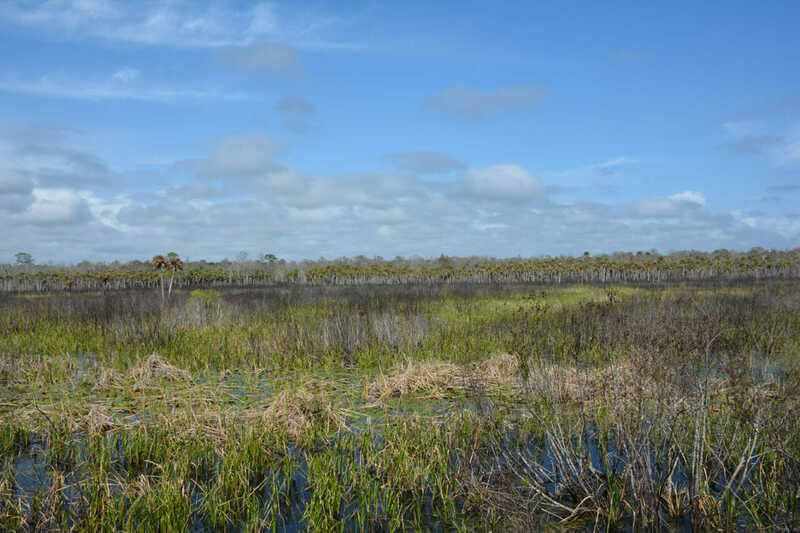 Expect outstanding panoramic views and unparalleled wildlife watching, especially for the variety of birds and for the number of alligators that live in the brackish waters that surround the trail.